This beautiful one bedroom ground floor apartment (named Oyster Catcher) is located in the quiet village of Pityme, ideally situated a few minutes drive from the stunning Cornish coast and beaches of Rock, Daymer Bay and Polzeath. The property boasts its own private patio and outdoor dining space overlooking the owner's mature gardens. The apartment is conveniently located near to local shops, including a deli, butchers, bakers, newsagents, post office, fish mongers, and Spa. The St Enedoc golf course, local sailing club, surf schools and the passenger ferry to Padstow are also minutes away, so there is plenty to occupy visitors within the immediate vicinity. The area is well-known for a wide range of great places to eat, including award-winning, Michelin starred food; Nathan Outlaw, Rick Stein and Paul Ainsworth all have restaurants close by. The Pityme Inn pub is located within easy walking distance of the apartment. Oyster Catcher is located within the owner's newly renovated home and has been furnished and equipped to the highest standard. The apartment benefits from a separate entrance, ensuring complete privacy for guests. Oyster Catcher benefits from a fully equipped kitchen, including built-in oven and microwave, dishwasher, fridge and washing machine. In addition, the property contains a smart TV, DVD player,an ipod-docking station and free wifi. All linen and towels are provided and changed weekly. We moved to Cornwall in 2015 and have lovingly renovated and modernised this large 1970s property into a light,airy and contemporary home which we now share with our Goldendoodle puppy, Martha. Having enjoyed many happy holidays on the North Cornish coast, we are delighted to be able to offer the apartment to people who enjoy the rugged beauty and tranquility of being near the sea. We have enjoyed creating a peaceful and homely getaway and hope you enjoy it too! A tarmac pathway leads from the parking space to the entrance to the apartment. There are no steps. Helena, Ann and Mattie were very welcoming. The apartment has everything you need, was beautifully decorated and very clean, and is in a great location to explore Cornwall from. The welcome bottle of prosecco was a lovely touch. Will definitely stay here again. Lovely apartment with everything you need and great location. We have had a lovely few days in this lovely apartment. The apartment is very well equipped with everything you need. It’s also in a really good location for visiting Cornwall. The owners are very welcoming and always available for a chat if you need any advice. Thank you for a great review. We are really pleased you enjoyed your break and were able to do quite a lot of coastal walking whilst here. Thank you for leaving the apartment in an immaculate condition, it is very much appreciated. We would love to welcome you back to Oystercatcher when you are next in Cornwall. Perfect location and beautiful apartment. Wonderful apartment, good location and great hosts. We were made to feel very welcome as soon as we arrived. The apartment was perfect for us, with modern, top quality fixtures and fittings and a nice homely feel. Location was ideal to explore beautiful Cornwall and we enjoyed the walk down to Rock and the ferry across to Padstow. Thanks to Helena and Ann for making us feel so at home and Mattie for saying "Hello" at the gate most evenings. We would recommend to everyone and hope to return again in the future. We absolutely loved our stay. The apartment was delightful - tastefully decorated and beautifully and thoughtfully furnished with a charming little private patio where we could bask in the evening sunshine. The perfect base from which to explore the delights of this lovely part of Cornwall. Our hosts could not have been more welcoming and kind and we would not hesitate to recommend their apartment to anyone. Thank you for such generous comments. We are so pleased you both had a lovely holiday; you were fantastic guests and we would love to welcome you back whenever you are in the area again. My partner Colette and I stayed for a week in this lovely little apartment with our two dogs last week and we were delighted with our stay. 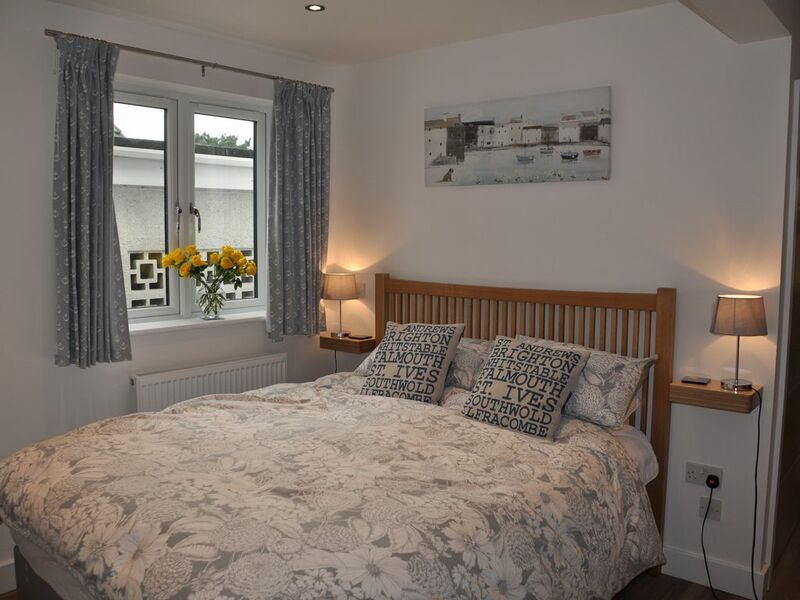 Helena and Ann are very welcoming & hospitable, the apartment was immaculately clean, well presented just as the photographs and the garden was beautiful - perfect to sit out for meals and a glass of wine. The kitchen is very extensive, very well equipped, offering everything you could possibly want to cook yourself proper meals. Location is perfect - two second drive to shops, Rock Beach and I would highly recommend this place to anybody looking for a perfect holiday base for the perfect Cornwall holiday.